With its subtly sweet dressing, and fresh fruit, (including raspberries and kiwi), and nuts, this Raspberry Spinach Salad Recipe has a fantastic flavour! If desired, you can easily substitute fresh strawberries for the raspberries. With its fresh and vibrant colour, this salad is a treat to the palate and a sure feast for the eyes! Our family is always thrilled when they see that I am serving this delicious and nutritious raspberry and kiwi spinach salad. Including kiwi in a salad is unique and always welcomed! Whisk the vinegar and jam in a small bowl or blend it in a food processor or blender. Add the oil in a thin stream, blending well; set aside. 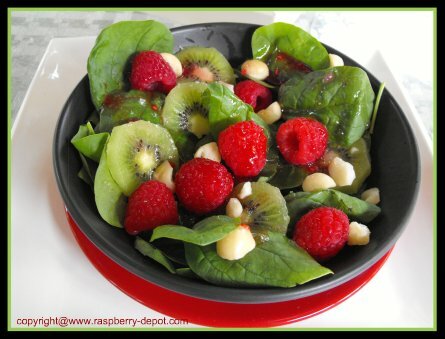 Carefully toss the fresh spinach, nuts, raspberries, and the kiwis with the dressing. If desired add the seasoned crotons, (optional). Looking for Raspberry Salad Dressing Recipes? If you wish to speed up the ripening of unripe kiwi fruit, place the kiwi in a paper bag with bananas. Many people know that raspberry fruit is nutritious, but how many people know that tea made from red raspberry leaves is very beneficial for women's health? Red raspberry leaf tea contains essential nutrients including calcium, iron, magnesium, vitamin C and E, and B vitamins, specific vitamins and nutrients which are very important during pregnancy.